Congratulations on your new deal! Time to email your wiring instructions so you can forward it to the buyer ASAP! Wait, your escrow company said that they will only email the instructions directly to the buyer? Give me just a minute. This may save your client money and possibly your career. 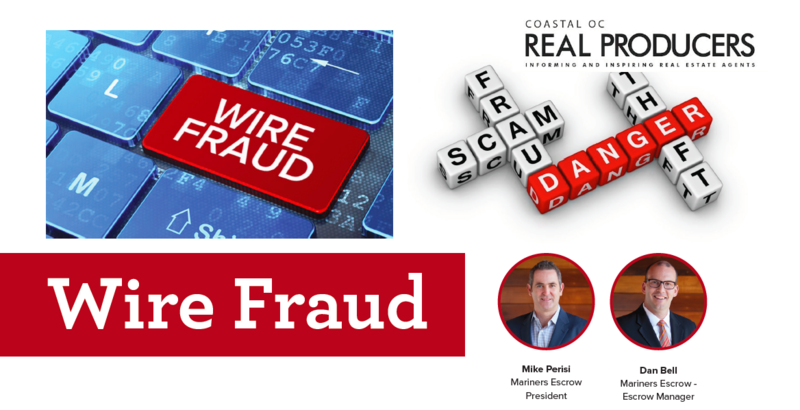 Wire fraud has become public enemy number one, and no one is safe from the financial ruin left in its wake. The Department of Business Oversight is currently receiving up to 3 wire fraud reportings a week! This is just one government agency that regulates several hundred independent escrow companies. Now, imagine what the Department of Insurance (i.e. Title Companies) are seeing – and dare we say, the Department of Real Estate. It is a scary proposition to say the least. Banks have elected to remove themselves as a responsible party in these transactions simply because they do not lose money in a wire fraud case. Their position is, they get authorization to send the funds and are merely following client instruction as to when and where to wire monies from said account. Which means the consumer is left with the total loss. Wire fraud is pervasive because when a wire is sent, it instantly becomes accessible on the recipient’s end. This leaves little to no time to intercept funds from the fraudulent account before they are withdrawn, and typically sent overseas. Keep in mind, that while wire fraud and hacking can present itself at any time throughout the process, typically the perpetrators will wait until the close of escrow when the large transaction is about to take place. So, what are you doing to look out for the best interest of your client and protect yourself? Your best first step is to work with a reputable and experienced escrow holder that is aware of the problem and has procedures in place to combat wire fraud; ones that devote extensive resources and time communicating with banks and various law agencies to educated ourselves on methods which are being utilized to commit wire fraud. With this information, they establish policies and procedures to counteract the current environment. This information should be shared routinely with staff in order to reinforce policies and procedures with all employees who work on your escrows. Understanding employees is the first line of defense in the battle against wire fraud. In addition, having direct contact with the FBI who would aid in freezing funds to a fraudulent account is important, time is of the essence. Getting funds frozen in the fraudster’s account is the number one priority in the unfortunate event of wire fraud, which significantly increases the chance of recovery. Escrow companies should also have an incredibly close relationship with their bank. Wires sent should be through a dedicated, secure, non-network connected computer. Find a company that has a team who specializes in education and recovery assistance of fraudulent wires. Our hope is that you should never experience such an unfortunate event. A big part of prevention on your end is the choice of service providers. As with any service provider, including escrow, not all companies are created equal, make a careful decision.